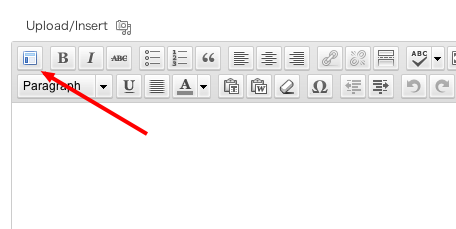 Template button will added to the visual editor when you install this plugin. You can select & insert template from popup window like below. Templates will saved as custom post type. You can add and edit template on the visual editor. All templates are losted after update 1.6.1 to 2.x. Please re-activate this plugin once after deactivate. Can not show template on TinyMCE popup. Please click “Save Changes” on [Settings] – [Permalink Settings]. WordPress will flush cache for permalink in this action. This problem has been solved since the 2.x. I love this plugin. I’ve been looking for this solutions for months! THANK YOU! And then WP just came out with version 3.3 which seems to disable it! ARRGH! Is there any chance you can fix it? This problem was fixed just now! The template button is not showing up in Tinymce Advance. Any ideas? I know this problem. Sorry, but i have no idea. Hello and thanks for an excellent and useful plugin! Question: I’m also using qtranslate, so I can have the site in both English and Norwegian. This wraps the page titles in the “Insert template” box in a english textnorwegian text. So it doesn’t look very nice for the end-user. Could you point me to where the “Insert a template” menu is generated, so I can change it to only show what’s between the :nb brackets? Please try and tell me result. This works fine if there’s only one language variable and and the template title is one word only. Paypal donation on the way for your great service! I was fixed this problem like below. Is possible to parse shortcode when insert the template into a post ? Yes you can use shortcode. Some shortcode will not work without Post ID. But, your shortcode is not need Post ID, you can use filter hook like below. Please copy and paste to functions.php in your theme. It says that one can share templates, where can I see shared templates? is there a direct lnk for good templates ? any screenshots ? You can see template list like following URI. You have to search “template_external_list_url” at HTML source of wp-admin/post.php. The value of “template_external_list_url” is template’s URL. I tried finding the URI you specified but can\’t find it. Great plugin – just what I needed. I have a feature request. Is it possible to add categories and tags to the templates and then have an option to sort the templates when inserting them into tinymce by categories or templates? GREAT JOB MAN ! THANKS ! When i insert the template in my french page, the template appears in the english page, it doesn´t want to appear in french. How i can resolve it please ? But I will study when there is time. I really like the plugin. I have read a post and I’m wondering is this was fixed? and paste it in the empty editspace of a new post or page, and add new text and images. Your plugin makes it an easier job, I guess. But wouldn’t it be great having a large worldwide website/database of pictures of nice looking WordPress posts and pages with the html-code of their layout available, and that you caan feed that databaseand download from it, like real sharing? Is that too simple a thought? Or does this database already exist? By the way, exactly in what map of the WordPress installation are templates being saved by default? I’d like to move the map from one website root to another. It’s said before, but I as well can’t find that particular map. Umm …, This plugin may be differing from what you expect. This plugin is for enable it to contribute simply. Thank you Takayuki, for your quick repsons. No real answers. I’m just curious. 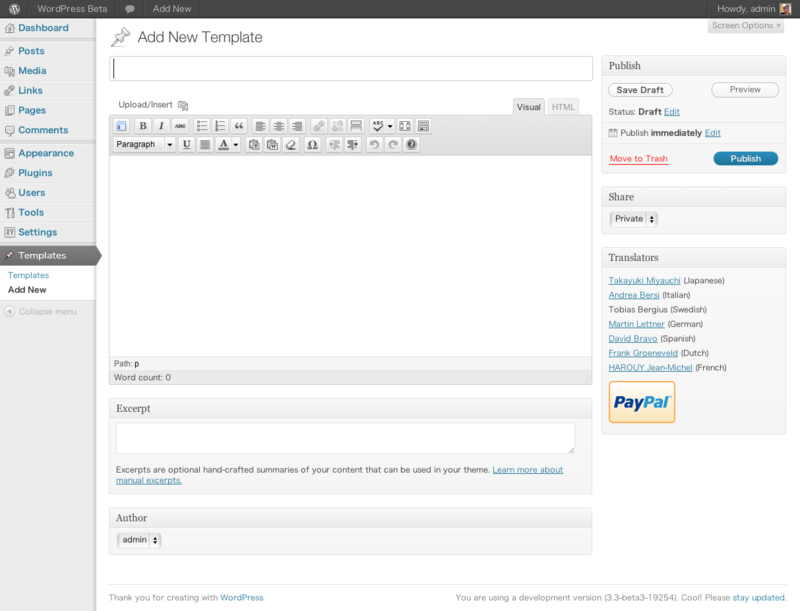 Hi, I just migrate in WP 3.5 and your plugin is not working anymore, he can’t list my template, the droplist is empty! I’ve tried to desactivate and reactivate your plugin, and save in permalink like you said in known issues but my list still blank ! Please help me. I’m using your plugin for a school blog and your plugin is very useful for us ! It was wrong yesterday but it works today ! Thanks for your help… and your work ! The current available version is 3.0.0, and it is still broken. HELP! Sorry. 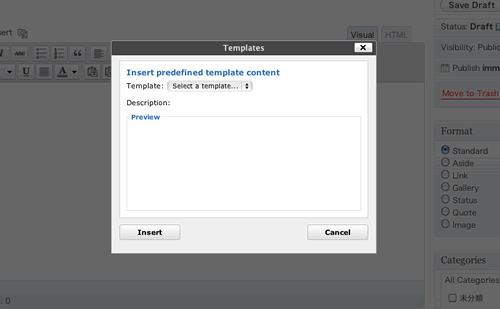 I mean that I am running version 3.0.0 of the templates plugin, but can no longer see my templates. I am running wordpress 3.5. When still not solving, there is a conflict with other plug-in. If other plug-in takes out an error, it stops operating, since api of tinymce changed wp3.5. Thank you for your reply. The only update to my system is WordPress 3.5. No other plugins have been added or updated. I’ve deleted the cache , deleted and reinstalled the plugin, deleted and rewrote the templates, but it still fails. I guess I’ll just have to wait for the next version. Thanks for all your hard work. After I did what you said, the button appeared when I reopened the tinymce editor. Great plugin, thanks for creating this plugin, it saves so much time! Hello. I love your Plugin. It helps me a lot. But now I can’t choose a template in the Dropdown-Menu! I have 4 different Templates, but the Dropdown-Menu show none of them! I tried to deactivate all the plugin without yours and Ultimate Tiny MCE, but the proplem still exists. Can you send me error’s on browser’s debug console? I will try to check! Sorry for waiting. I was busy the last days! It’s interessting, but today the Plugin runs again without an update and I have no Idea! So, I don’t have any error message! Anyway, thanks for your help and this great plugin! Sorry for this wrong alert. I was updated paypal link in footer. Thanks – small donation made – wish it could be larger as this is a terrific plugin. I also have a question: is it possible to make a template of the whole of a page. What I mean is the html PLUS the css, not just the html code. Is that already possible and if so how? If it isn’t possible, that would be SO useful. > What I mean is the html PLUS the css, not just the html code. maybe use inline style in the template. Thanks for the clarification. Unfotunately I have a lot of css on my pages. Is there any chance of your plugin being changed to allow for this at some time in the future? Sorry, it is seems difficult and I am not currently planned. I am having trouble when I insert a template created using this plugin. When I do so the new code is being inserted inside the last div on the previous page instead of below that div. Please see http://www.oldmapsandprints.com.au/lv_4_tmpl-2-2/2/. As a result, the sidebar is being pushed below the main page. Here is the code that shows that the template code, starting with is being inserted inside the div instead of below it. I would be grateful for your help please.